Nowadays measuring social interaction becomes more and more important. The social activity level of an animal – similar in humans – is highly sensitive to the inner status. Often it can be a better indicator than behaviors measured in other test situations. Motivation is the main premise for social interaction. But difficult to measure with conventional tests. Even minor changes in the health status can cause sensible changes of the motivation of an animal. Therefore measuring social interaction behavior can give you a clue when other tests deliver no significant results. This is needed to analyze animals’ orientations towards each other and to distinguish between head-to-head and head-to-tail distances. Two animals’ centers of gravity are tracked. On the left side both animals pass each other without a real contact. On the right side one animal approaches the other animal actively. In both situations the positions of the tracked points are similar. Without orientation measurement it is not possible to distinguish between these very different events. Based on the three-point-tracking (nose, body, tail) we can clearly distinguish between a simple passing on the left side (passive contact) and an active contact on the right side. The Viewer software “knows” the orientation of the animal. It can use the visual angle and other parameters based on the three-point-tracking to measure an active approach. 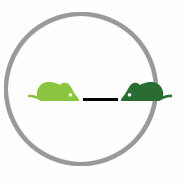 The Three Chambers Test measures the sociability of a mouse. Sociability in this context is an animal’s instinctive tendency to stay in frequent contact with a social partner. This page presents the Three Chambers Analysis Plug-In for Viewer. This Viewer plug-in produces a time line based survey on distances between animals. It issues tables with minimum, maximum and avarage distances between all simultaneously tracked animals. You can also group animals to find out whether social group members stick together or not. A detailed description will be available soon. Monitor Trainer measures an animal’s response to a virtual (key) stimulus. Stimuli are presented as pictures or video snippets on one or two monitors. Viewer is used to trigger stimulus replay dependant on the animal’s position or time sheduled. More details on this Viewer extension can be found in this user story. The Social Contact Plug-In is a software in pre-release status. Our approach is to use user defined filters to classify contacts between animals. These filters are composed of parameter thresholds for visual angle, head and tail activity, speed of forward heading, duration of contact and whatever you like to contribute to the release version. We are looking for a customer to do the final developement steps together. More details on this Viewer plug-in will be available soon.